"One of the events is an exhibition of artwork by people who have experience homelessness, which has started today in the 'glass box' pavilion building on the large square in Riverside Bedford, and runs through to Friday. Bedford Homeless inter-agency Officer Sam Price gave me a sneak peek of the exhibition last week, and I can tell you that it is very well worth a visit." SoupFest - Tuesday 27th November 11.30 - 6. 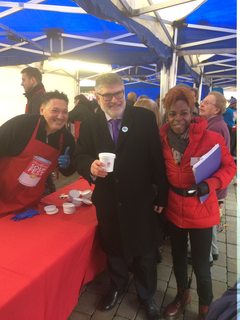 SoupFest is an annual festival of soup, showcasing Bedford's talented chefs, and working closely with local businesses and volunteers to raise money to help the homeless. There will be live music, great food and more. Mayor Dave Hodgson attended earlier today, and you can see a selection of photos he posted from the event here. SOLD OUT*** 'Sleeping Rough' film screening at Vue Cinema - Tuesday 27th November 6.30pm*** SOLD OUT, followed by a drinks reception and an exclusive Q&A with the film's director. Tickets have sold out in advance for this event tonight. Thursday 29th November 10.30 - 1 (choice of times). If you've ever wanted a sneak peak inside the Bedford Nightshelter, here's your chance! Book your free place here.